and circularization options can be added on. OEM is responsible for compliance with all safety regulations. 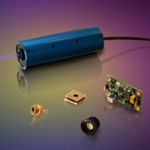 Operational Hazard-Semiconductor Laser Diode Module: This laser module emits radiation that is visible and harmful to human eye. When in use, do not look directly into the laser emitting aperture. Direct viewing of laser diode emission at close range may cause eye damage. Limited Warranty: One year. No warranty coverage for disassembly, modifications or damage due to abuse or misapplication.